The new 2014 Mercedes-Benz Black Series Coupe is all about harnessing speed in the new Need for Speed Rivals video game coming in November. The new Need for Speed Rivals video game takes the 2014 Mercedes C63 AMG Black Series Coupe and gives it a new badge. And this badge will catch any illicit car on the road and make them pay. That’s what it will be like in the new Need for Speed Rivals video game coming out November 19, 2013. Gamers will have at their disposal, the new Mercedes-Benz C63 AMG Black Series, that will be one of the fastest cop cars to drive. Just imagine having all that power to catch any illicit racer on the road that you want. I wish they had these games when I was kid. This writer grew up with Pac Man and thought that was cool. Need for Speed Rivals brings to life driving some of the best high-performance cars on the planet. Gamers get to be an undercover cop and chase the bad guys driving some awesome cars. 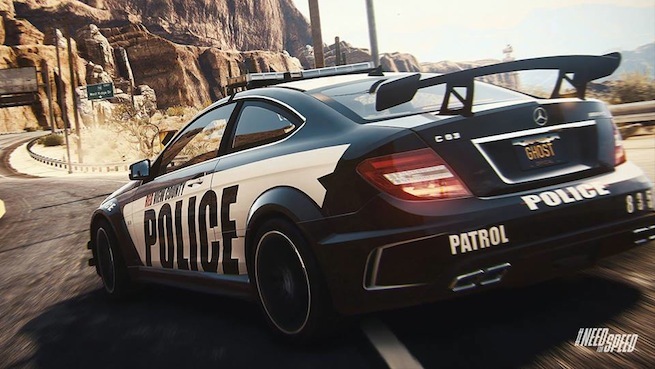 This all takes place in Redview County, and according to Need for Speed, it’s “a gritty open road environment where the intensity of the street’s ultimate rivalry between cops and racers never stops.” The list of cars is impressive and Mercedes will have two cars, the C63 AMG Black Series and the SLS AMG Coupe Black Series for gamers. But the impressive list also includes the Audi R8 Coupe V10 Plus 5.2 FSI Quattro, Hennessey Venom GT, Ford Shelby GT500, Ford GT, BMW M3 GTS, Lexus LFA, Ferrari F12 Berlinetta, Koenigsegg Agera R and Nissan GT-R Black Edition. My favorite car on the list is the Mercedes C63 AMG Black Series Coupe that Mercedes calls a “bruiser”. Their team in Affalterbach created the C63 AMG Black Series and made a bona fide street fighter. When you see those flared wheel arches and its jutting jaw looming in your rear-view mirror with lights flashing,it would be a good idea to pull over and let its 510-hp go on by. Mercedes took the brilliant C63 AMG and fit it with lighter pistons and connecting rods, gave it special brakes and wheels and a performance exhaust. The intoxicating 622-hp SLS AMG Black Series is also on the list and is really a SLS AMG GT3 racecar with license plates. It’s the fifth Black Series model from Mercedes and the most extreme version yet. It’s the fastest SLS in the history of the company. Now both the Mercedes-Benz C63 AMG Black Series Coupe and SLS AMG Coupe Black Series will harness “the power of dark matter.” Both cars are nothing but sheer AMG "Driving Performance" in the new Need for Speed Rivals. Now you can catch any illicit racer you want. Get ready to chase on November 19, 2013. Watch Need for Speed Rivals Trailer - Undercover Cop Reveal video.